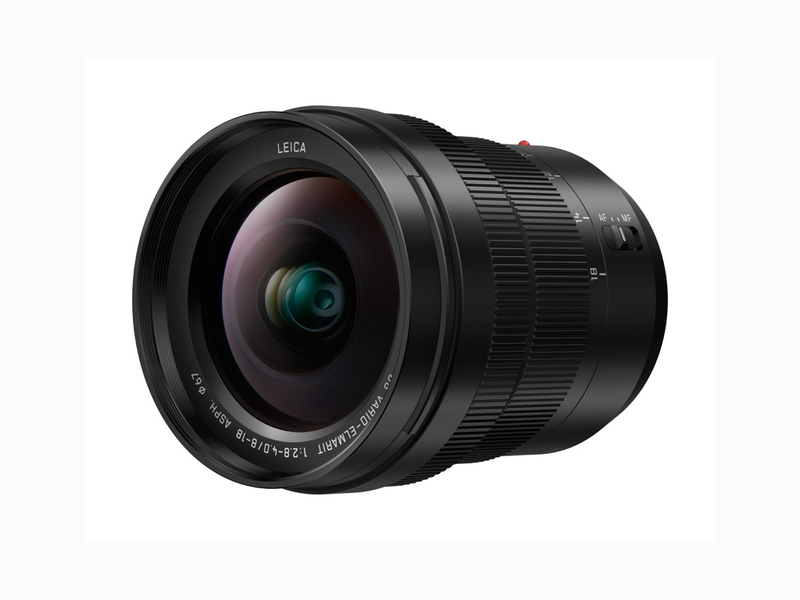 Panasonic has introduced the LEICA DG VARIO-ELMARIT 8-18mm F2.8-4.0 ASPH lens, the second lens to be introduced in the LEICA DG VARIO-ELMARIT F2.8-4.0 series. Its zoom range of ultra-wide-angle 16mm to 36mm (35mm equivalency) and compact size make it a versatile imaging solution for a variety of photo applications, from street photography to landscape work, as well as quality video recording with its maximum 240 fps sensor drive. The lens is optimized to work with high-speed cameras with precision Contrast-based AF systems. The lens features 15 elements in 10 groups, with an aspherical ED (Extra-low Dispersion) lens, three aspherical lenses, two ED lenses and an UHR (Ultra High Refractive Index) lens to avoid spherical distortion and chromatic. It includes AF tracking when zooming, and Panasonic’s Nano Surface Coating technology helps to minimize ghosting and flare. The 8-18mm is built to perform in the elements, with a dustproof and splash-proof design; it’s freeze-proof down to -10º F.
Look for a 50-200mm telephoto zoom to join the Panasonic LEICA DG VARIO-ELMARIT F2.8-4.0 series at a future date. The LEICA DG VARIO-ELMARIT 8-18mm lens is scheduled for late May 2017 availability, with an MSRP of $1099.99. Newark, NJ (April 18, 2017) – Panasonic is proud to introduce a new wide zoom digital interchangeable lens, the LEICA DG VARIO-ELMARIT 8-18mm / F2.8-4.0 ASPH. (35 mm camera equivalent: 16-36 mm) as the second lens to be introduced from its LEICA DG VARIO-ELMARIT F2.8-4.0 Series. Covering a focusing distance from ultra-wide angle to super telephoto, this new LEICA DG VARIO-ELMARIT F2.8-4.0 series achieves exceptionally high descriptiveness for both photo and video recording and yet its size is compact. All lenses also take advantage of Panasonic’s Nano Surface Coating technology to minimize ghosting and flaring. The 8-18 boasts a rugged, dust/splash-proof design and is freeze-proof down to -10 to deliver professional use under harsh conditions. The high-quality video recording capability is also one of the advantages of this lens series. The sensor drive at max. 240 fps enables to take full advantage of cameras with high- speed, high-precision Contrast AF. It also helps to reduce wobbling. Notably, the new lens excels in video recording performance. In addition to the silent operation achieved by the inner focus drive system, the micro-step drive system in the aperture control section helps the camera to smoothly capture brightness changes when zooming or panning. The optical design achieves exceptional barycentric stability to minimize image shifts during zooming. The AF tracking performance when zooming is also improved thanks to high-speed frame analysis for focus control. The 8-18mm lens will be available at the end of May for a MSRP of $1099.99. Offered in sharp, metallic black, it stylishly matches the LUMIX G Digital Single Lens Mirrorless (DSLM) cameras. The LEICA DG VARIO-ELMARIT F2.8-4.0 Series lineup will expand with additional 50- 200mm (100-400mm, 35mm camera equivalent) telephoto zoom lens. Based in Newark, NJ, Panasonic Consumer Electronics Company is a division of Panasonic Corporation of North America, the principal North American subsidiary of Panasonic Corporation. The company offers a wide range of consumer solutions in the U.S. including products from VIERA Life+ Screens, Blu-ray players, LUMIX Digital Cameras, Camcorders, Home Audio, Cordless Phones, Home Appliances, Beauty, Grooming, Wellness and Personal Care products and more. In Interbrand’s 2014 annual “Best Global Green Brands” report, Panasonic ranked number five overall and the top electronics brand in the report. To learn more about our products, visit panasonic.com. Follow Panasonic on Twitter @panasonicUSA; additional company information for journalists is also available at www.panasonic.com/pressroom.